Just about 35 miles northwest of Augusta, in Appling Georgia, is Mistletoe State Park and Clarks Hill Lake. Some of the best bass fishing in the nation is available on this 70,000+ acre lake and the Park offers excellent campsites for tents and RVs. Nearby Augusta, is a mecca for golfers dreaming of the Masters Tournament but it is also an interesting riverside stop along Interstate 20. The downtown is revitalizing with new restaurants and shops and the River Walk is a great place to stroll or jog. Mistletoe State Park could qualify as a destination in itself. The park is situated on 70,000+ acre Clarks Hill Lake in Appling, Georgia. The campground is set on a peninsula which offers amazing views of sunrises and sunsets over the lake. Sites are offered on the lakefront and the interior, but all seem to be in view of the lake. Each is equipped with picnic table, grill, fire pit, water and electrical hook-ups. There are good shower facilities in the campground area. 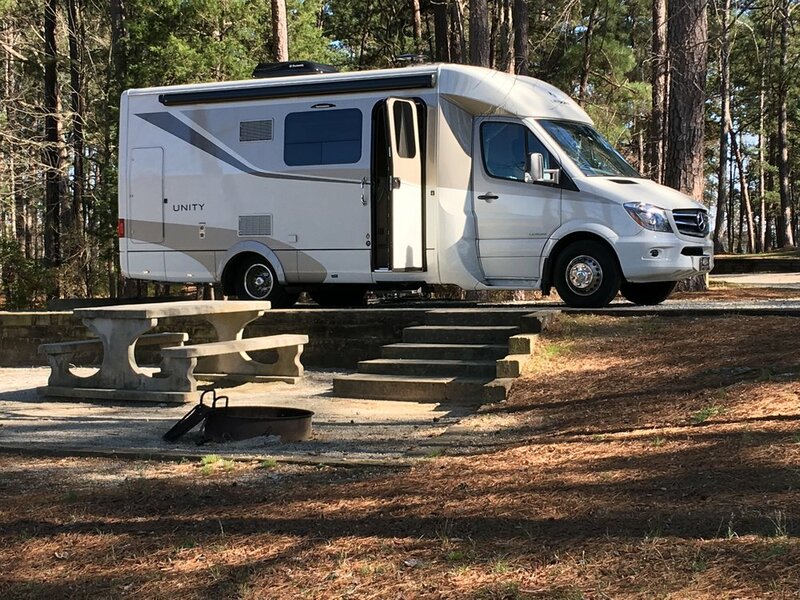 The sites are pretty level and roomy enough to easily house an RV and kayaks. Some are large enough to hold a tent in addition to an RV. The Park also offers 10 fully equipped cottages for rent, five of which are actual log cabins. We were fortunate enough to get there early and score a site by the lake. The water views are amazing - even when the lake water level is low during the dry, winter months. The Army Corps of Engineers offers several additional campgrounds around the lake with excellent amenities, so if Mistletoe is booked up, try one of the Army Corps campgrounds. Fishing: with some of the best bass fishing in the country, Clarks Hill Lake hosts a variety of fishing tournaments. If you have a competitive nature, you can compete for multiple varieties of bass including striped, large-mouthed, and white bass. Hiking: There are 8 hiking trails in the park, all well marked with blazes color-coded to the individual trail. In strenuousness, trails range from a 10% to a 25% grade over 200 feet. The most challenging is the 6.25 mile Rock Dam Trail that requires 4 stream crossings and traverses a deep ravine near the highest point in the park. The shortest and easiest trail is the 1/3rd mile Canyon Loop Trail with only a 10% grade over 200 feet. The Campground Trail is another good option for a quick hike. At only 1.5 miles its 15% grade is an easy hike. Trail maps are available at the office. Kayaking/Boating: Put-in your kayak or boat at any one of the three boat ramps within the State Park grounds. Clarks Hill is also known as Lake Strom Thurmond, and operated by the Army Corps of Engineers. As such the water is lowered each winter, so be prepared for somewhat limited access during those months. Just 40 minutes away, you can glide along the Augusta Canal. With multiple put-in points, you can choose the distance of your paddle excursion along the Canal through the city of Augusta. Birding: Get out your binoculars and enjoy the wildlife attracted to the water. Red Hawks, egrets, herons, grebes, as well as mallard ducks and cormorants, are all commonly sighted along the waterway. Shopping: In nearby Augusta, you can find typical shopping of a small city along with some interesting boutiques and shops in downtown. Take some time to browse around Artists Row on Broad Street, or check out the Saturday Market along Augusta's Riverwalk, open in the spring, summer and fall. Attractions: Stroll along the Riverwalk in Augusta, and browse through the Morris Museum of Art dedicated to art and artists from the American South. Or explore the Augusta Canal Discovery Center to learn how the canal was built and the impact it has had on the economy of Augusta through the years. Woodrow Wilson's boyhood home offers a great tour, and if you want a more local, intimate experience stop by the Lucy Craft Laney Museum of Black History. Restaurants: Augusta boasts a great selection of dining options from locally-sourced farm-to-table restaurants to quick bites and casual lunches. The Whiskey Bar Kitchen always rates high with great food, but if you want something simple and delish give Hildebrandt's Deli on 6th street a try. 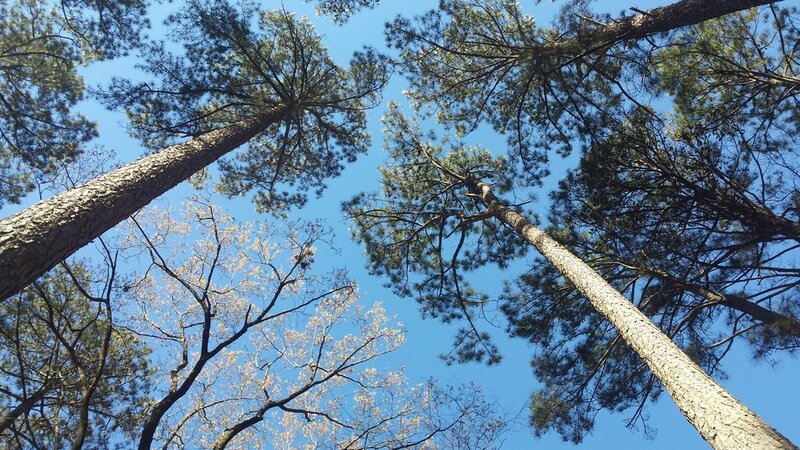 We found that visiting Mistletoe State Park in the winter months afforded us a more peaceful atmosphere. The campground is quiet and the hiking trails all but deserted. The lake level is lower and that gave us the opportunity to walk along the shore where it was covered with water just months before. Sitting by the lake reading a book or hiking the deserted trails and lakeshore allows us to be 'present'. Instead of getting tangled in our thoughts, we attend to the task before us - stepping carefully over rocks, mud, and brush, looking for the next trail marker, noticing the movement of the trees, the sound of birds and wind. That sense of presence can be quite refreshing setting the stage for reflection on the beauty around us and the peaceful feeling only time spent in nature can impart. A couple of days enjoying this kind of solitude prepares us to re-enter our normal, hectic life. It is important to note, that 'hitting the reset button' does not include mulling over problems or issues. It is giving your mind and spirit time to recalibrate, silently processing the issue of life under the surface, sub-consciously. Similar to the process our minds go through when sleeping and dreaming, the practice of presence is an important part of our wisdom building. There will be time on other trips to examine problems and self-development, turning those over in our minds like stones in hand. Yet the success of that kind of reflection is dependent on these times of practicing presence, clearing the mental path of debris.